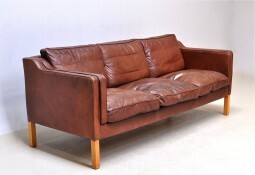 Danish three seater leather sofa in a richly patinated tan hide - a beautiful colour. You might be expecting to see a pair of sofas on this page. Sorry, but the two seater sofa has sold. 201 cm wide, 84 cm deep and 74 cm high.